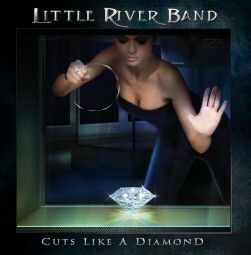 Produktinformationen "Little River Band - Cuts Like A Diamond (Vinyl / LP)"
"Cuts Like a Diamond" is the first album of original material in more than a decade and shows again all the trademark vocal harmonies along with a superbly crafted songwriting which will gain the respect and love of all the music fans from all over the world. LITTLE RIVER BAND is one of Australia's most significant bands, with Worldwide album and CD sales now in excess of 30 million. They also set a record for having Top 10 hits in the US for 6 consecutive years... the first band to achieve that mark. According to BMI, their song "Reminiscing" has garnered rare status with over 5 million airplays on the American radios, and "Lady" is close behind with over 4 million airplays. Little River Band nowadays is stronger than ever: there is a new element of youthfulness and vitality, anchored by leader and consummate lead vocalist / bass guitarist Wayne Nelson, who began his LRB career in 1980. Weiterführende Links zu "Little River Band - Cuts Like A Diamond (Vinyl / LP)"
Kundenbewertungen für "Little River Band - Cuts Like A Diamond (Vinyl / LP)"